Got Brown, Crispy Plants? Put Down Your Pruners! Got brown and crispy plants? Put down your pruners if winter has not ended yet! Are you having a hard time ignoring them the ugliness of the frost-damaged leaves? Or perhaps you have no problem with some brown spots in your garden. There has been some discussion on my social media pages from people asking if they can safely prune back their plants now and I know that some of you are just itching to get outside with either your hedge-trimmers, loppers or hand pruners. Well, before you pick up your pruning tool of choice – I have some important advice for you. Okay, was that obvious enough? You may be asking why you can’t go outside and prune away that brown ugly stuff in your garden. Well, the answer is that you can eventually prune it away, just not now. There are three very good reasons not to prune back your frost-damaged plants during the winter. 1. Oftentimes, the brown, dead looking branches are not dead on the inside. The warm temperatures of spring will stimulate new growth in much of the dead-looking branches. If you prune your plants too early, you may be removing live branches. 2. In general, pruning stimulates plants to produce new growth. Many gardeners make the mistake of pruning too early before the threat of cold temperatures has passed and then a period of freezing temperatures occurs, which not only kills the new growth but can even result in the death of your plant. 3. The brown and crispy stuff actually protects the interior and sometimes the lower foliage of your plant from further cold damage. So, I hope these reasons help to convince you to turn a blind eye to your brown and crispy plants for a little while. I learned this lesson the hard way. Years ago, I was in charge of decorating with plants for a large event. I purchased 100 potted geraniums and arranged them expertly with my crew in late February. The night before the event, we had a late frost that damaged every single geranium and we have to rapidly replace them. I should have used a plant that was more cold hardy. So, maybe you can’t stand having frost-damaged plants in your garden anymore. If that is the case, I have an assignment for you…..
Take a drive through your neighborhood and those close by as well. Look at your neighbor’s front landscapes and see what plants are still green and did not suffer any frost-damage. The yucca, desert spoon, and pygmy date palm all did well while the trailing lantana did not. The ficus tree fared poorly while the tipu tree did well. When looking around, you will find exceptions. Some plants that normally would suffer frost damage look healthy and green. As you can see, there is a large blue palo verde tree with a ‘Torch Glow’ bougainvillea underneath to the right. You may note that this bougainvillea did not suffer frost damage. The overhanging branches of the palo verde tree provided some protection from the cold temperatures. This knowledge can be quite helpful to you if you like having frost-tender plants in your garden but don’t like the brown and crispy winter look. By placing plants such as lantana and bougainvillea underneath a tree with filtered shade, you can oftentimes skip the ugly, winter stage. Before you know it, winter will have passed and you can grab your pruners and get busy in the garden! https://www.azplantlady.com/wp-content/uploads/2013/01/DSC_0035.jpg 513 640 arizonaplantlady@gmail.com http://www.azplantlady.com/wp-content/uploads/2018/10/favicon.png arizonaplantlady@gmail.com2019-01-31 06:00:002019-01-30 20:35:46Got Brown, Crispy Plants? Put Down Your Pruners! Have you ever driven past a landscape that had some problems with it? As a horticulturist and landscape consultant, my attention diverts whenever I see ‘Landscape No-No’s’ like this one. It’s important to not that my reasons for showing examples like this aren’t to shame the homeowners. Instead, my goal is to help others to learn to identify problems and give them easy steps to correct or avoid them in the first place. 1. Shrubs are planted too closely together. It’s obvious that there are too many plants in this area and the mature size of the shrubs wasn’t factored in the original design. The types of flowering shrubs in this area – desert ruellia (Ruellia peninsularis), Baja fairy duster (Calliandra californica), and ‘Green Cloud’ sage (Leucophyllum frutescens ‘Green Cloud’) are good choices. The problem is that they are spaced too closely together and pruned the wrong way. 2. Lack of different plant types. As you can see, there is a tree, a couple of succulents (prickly pear cactus & yucca), and a LOT of shrubs. However, the landscape suffers from an overabundance of shrubs. 3. Incorrectly pruned flowering shrubs. These lovely, flowering shrubs have been turned into anonymous, green blobs, lacking in beauty and character. In fact, you would have to look closely to be able to identify what each shrub is. The problem has to do with what is missing from this landscape, which are attractive shrubs allowed to grow into their natural shapes, covered in colorful flowers. Other problems associated with maintaining flowering shrubs this way is that it is stressful for the plant, shortens their lifespan, causes to them to use more water to regrow their leaves, and creates more maintenance. Remove excess shrubs. Remove 24 of the existing 32 shrubs so that you are left with eight flowering shrubs. To decide what shrubs to remove, learn what type of shrub they are and look up how large they are at maturity. Then, make sure that the ones that remain have enough room to grow. Shrubs should be places up near the house, to anchor the corners of the landscape, and flank an entry. Severely prune back remaining shrubs. One of the things I love about most shrubs is that they have a ‘restart button’ where much of the damage that has been done due to excessive pruning can be reversed. Severe renewal pruning entails pruning back shrubs to approximately 1 1/2 feet tall and wide. You’ll have nothing left but woody branches and little to no leaves. However, this stimulates plants to produce new, healthy growth. This type of pruning should be done in spring. The key is to keep hedge trimmers away from your newly pruned shrubs forever. Any pruning should be done using hand pruners, loppers, and pruning saws. This will work with most shrubs except for a few that were in declining health. Click here to see how to prune flowering shrubs correctly. Incorporate lower-growing plants such as groundcovers and succulents. A well-designed landscape has plants with varying heights, including those at ground level. For the landscape above, I’d add a few boulders and plant some gopher plant (Euphorbia rigida) and twin-flower agave (Agave geminiflora) alongside them. Other ideas for low-growing succulents include ‘Blue Elf’ aloe, Moroccan mound, and artichoke agave. Flowering groundcovers would also look nice like angelita daisy (Tetraneuris acaulis), blackfoot daisy (Melampodium leucanthum), and sandpaper verbena (Glandularia rigida). I like to use damianita, trailing lantana, and penstemon for color at lower heights. Here is a snapshot of a landscape area at the Desert Botanical Garden where plants have room to grow and are allowed to grow into their natural shape and form. Transforming the problematic landscape shown earlier, and others like it isn’t difficult, and the results are dramatic. What you are left with is a beautiful landscape filled with healthy plants that use less water and needs little maintenance. A Neglected, Overgrown, Nameless Rose…. This gardening story is all about one particular rose bush which is located at our small family farm, affectionately called ‘Double S Farms‘. I first posted this story about an overgrown, nameless rose 2 years ago. This poor rose had not been fertilized, deadheaded or pruned for a few years. Personally, I think it looks fantastic considering the lack of care it has received. The residents of Double S Farms, (my mother, sister and her family), had only recently moved to the farm, so this rose had been neglected by the previous owners. I had no idea what variety this rose was. I was pretty sure that it was a shrub rose and it had a lot of old, unproductive growth that needed to be removed. When finished, it would be rejuvenated and ready for the beginning of it’s new life with it’s new homeowners. My tools – hand pruners, pruning saw and loppers. Oh, I almost forgot – gloves! I also recommend wearing a long-sleeved shirt as well to protect your arms from being scratched from the thorns. First, because there is so much thick growth, I just started to cut branches in order to make a ‘hole’ like this, which made it easier for me to reach inside with my pruners to remove the interior wood. It is much easier for me to remove the larger branches at the beginning of the process instead of making multiple cuts of the smaller branches and working my way down. Normally, I remove about 1/2 of the height of the rose bush. But, in this case, I decided to remove quite a few of the large, old branches (canes) at the base of the rose as they no longer produced as many newer branches and roses as the newer canes do. This neglected rose bush has a lot of old growth that had to be removed, so I would be pruning it back by 2/3. First, I removed the old and dead canes. Then I selected the green, healthy canes that I wanted to keep and pruned back to an outward facing bud and cut at a 45 degree angle. Okay, you may be wondering why I am included this gross picture of a borer cut in half. Well, borers burrow into the center of the rose canes, causing damage as you can see in the cane to the right. My son thought it was so cool….he likes anything that is gross. *To help prevent borers in the future, simply apply some wood glue to the top of the newly pruned canes, which helps seal them out. Surprise! As I continued pruning, I discovered that there were actually two rose bushes which had grown together. Every January, it just kills me to prune back roses and watching all the beautiful blooms fall to the ground. But, beauty hurts and pruning will ensure that there will be more beautiful blooms for these rose bushes in the spring. Here is an example of a cane that has been pruned incorrectly long ago, (I told you this rose bush had been neglected and mistreated). You can see where it turned brown and died. When pruning the canes, be sure to prune back to a bud or back to the base of the larger cane. I was almost done. I continued cutting away all the remaining small canes and dead growth with my hand pruners. I used my loppers for the large canes that need to be removed. I enjoy pruning very much, but I hate this part…. But, I was lucky. I was able to bribe my son and daughter to help me clean up. Now all I had left to do was to remove all leaves remaining on the roses and clean up any leaves lying around the area surrounding the roses. I do this because the leaves can harbor fungal diseases that will reinfect the new rose leaves. Guess what? I found the old tag from when the rose bushes were planted. It is a ‘Glamis Castle’, which is a David Austin English Rose. I put the tag back on one of the rose bushes. I finally finished. The roses were no longer “Nameless, Overgrown or Neglected”. Pastor Farmer (my mother) came outside to see what I had done to her roses. She was a bit dismayed to see so little left of her rose bushes. But I assured her that they would be happy and healthy and covered with blooms in spring. Fast forward a few months, and these formerly neglected rose bushes were thriving again! It never ceases to amaze me how pruning, done the right way, can bring new life to an old, neglected rose bush. Do you have a list of favorite plants for your Southwestern garden? Today, I’d like to share with you about one of my favorite shrubs, desert ruellia (Ruellia peninsularis). It has beautiful, light-green foliage and purple flowers that appear off an on throughout the year, with the heaviest bloom occurring in spring. Unlike its cousin (Ruellia brittoniana), desert ruellia does not take over the garden space. It needs little maintenance, and looks great with a variety of other flowering plants. To see my other plant profiles for Houzz, click here. On the other hand, if you mention the word ‘mistletoe’ to an arborist or desert-dweller, you are likely to get similar expressions of unhappiness on our faces. Not because we don’t like kissing our sweethearts underneath the mistletoe – but because visions of a different type of mistletoe comes to mind which has absolutely nothing to do with kissing or the holidays. You may notice that this type of mistletoe does not resemble the mistletoe that we traditionally see during Christmas. Well, it is a parasitic plant like the traditional holiday mistletoe and they both belong to the same genus Phoradendron which means ‘thief of a tree’. If you happen to see mistletoe growing in your tree, I doubt that you are experiencing a surge of Christmas cheer, but rather the opposite. You may want to get rid of it if at all possible. Among some people this can be somewhat controversial. The argument for not removing mistletoe arises from the fact that mistletoe is naturally occurring and is part of the natural desert and birds love to eat the berries. On the other side of the argument, mistletoe does not usually kill the tree, but does stress the tree because it does steal nutrients from the tree, leaving the tree more susceptible to disease and other stresses which can eventually kill the tree over time. Mistletoe on a Mesquite tree growing in the desert. My first experience with the mistletoe debate occurred about 13 years ago. I was serving an internship with the Water Conservation Office for the City of Mesa and we were working on recommendations for an existing Botanical Walk, which had many beautiful specimens of desert shrubs and trees. Along the Botanical Walk was a huge Mesquite tree that had large clumps of mistletoe hanging from it. The tree was beautiful and was a favorite among the birds who would feast upon the mistletoe berries. 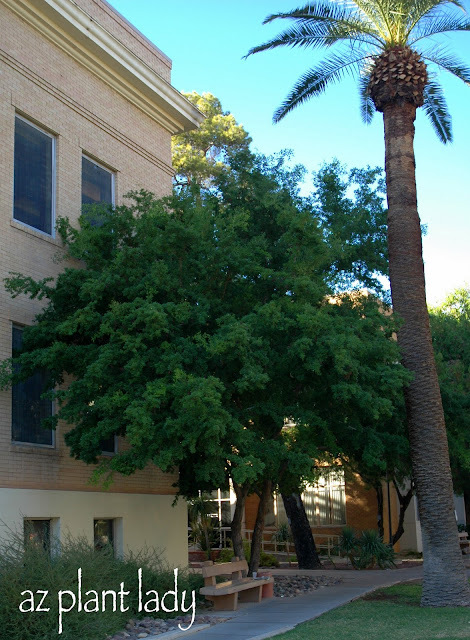 Now the Mesquite tree was representative of the natural desert and displayed the mistletoe that occurs in the desert. For that reason, the mistletoe on the tree was left alone. Now my personal recommendation of whether to keep or remove mistletoe is this…. Remove mistletoe as soon as you see it growing on your tree in a residential or commercial landscape setting. Now, it may take years for a mistletoe infestation to seriously stress a tree but my main concern is that mistletoe is easily spread to neighboring trees. Large amounts of mistletoe growing in a Mesquite tree in the Tonto National Forest. Even if the idea of having some mistletoe growing in your tree doesn’t bother you….it may bother your neighbors. Mistletoe is easily spread by birds. They love to eat the berries that the mistletoe produce. Well, you may have guessed what happens next – a cute little bird eats a berry….then flies to your neighbor’s tree…..and ‘poops’ out the berry onto a branch along with a nice little pile of fertilizer. Soon the seed within the berry sends roots (haustoria) into the branch that the bird landed on and soon a new mistletoe plant is born. How do you know if you have mistletoe? It is not always easy to see an early infestation – especially during the warm season when your trees are fully leafed out. I find many instances of small mistletoe infestations in my client’s trees, especially those people who live in the outskirts of the Phoenix metro area – near the relatively untouched areas of the desert. I took this photo at a client’s home. He had no idea that his Mesquite tree was infected. Palo Verde, Ironwood and Acacia trees are also types of trees that are also infected. Mistletoe is much easier to spot during the winter months when trees do not have as many leaves. Each year on the golf courses, we would do an inventory of all the trees to determine which ones had mistletoe so that it could be removed by pruning. If the infestation is rather small like the one in the photo above, then you can try pruning the branch at least 1 ft. beneath where the mistletoe occurs. This helps to remove the interior haustoria (roots) of the mistletoe. If you have a large branch infected and do not want to prune the branch, you can dedicate yourself to brush off the mistletoe. It comes off very easily by just rubbing it off with your hands. This method does NOT get rid of the infection inside of the tree branch and the mistletoe will regrow – meaning that you will have to remove the new growth as part of your garden maintenance. https://www.azplantlady.com/wp-content/uploads/2012/12/Mistletoe-3.jpg 640 426 arizonaplantlady@gmail.com http://www.azplantlady.com/wp-content/uploads/2018/10/favicon.png arizonaplantlady@gmail.com2012-12-10 16:58:002016-10-26 14:36:17Got Mistletoe? With all of the hustle and bustle of the holiday season, it as a blessing that our desert gardens need little, if any attention during this month, letting us have more time for all of our numerous holiday activities. I realize it is hard to believe that in our year-round gardening climate, that not having to do anything in your garden this month, can be a little hard to swallow. To put your minds at ease, I will get a little more specific…. For those of you “Type A” personalities who just have to find something to do in the garden, you can plant annuals or deciduous trees if you desire. You can even deadhead spent rose blooms. But, THAT IS ALL that should be done, and again, only if you are desperate to do something. I have had many people ask me if they can prune their plants now. The truth is, you can actually do more damage to your plants if you decide to prune them during the cold winter months. The reason is that pruning stimulates new growth that is very susceptible to cold temperatures and can even lead to the death of your plant. Although the frost damaged growth is brown and ugly and it takes all of your willpower to abstain from pruning it, do whatever it takes to keep your hands off! Go shopping, bake cookies, volunteer, take the kids to visit Santa or any of the other things on your Christmas to-do list. Believe it or not, the ugly brown frost-damaged growth actually protects the branches and leaves underneath. Some of the dead looking branches are not dead and will produce new growth in the spring. Hang in there until early March and then you can prune back the ugly growth. If you just can’t stand the frost-damaged “look”, you can work to prevent it by covering your plants on nights when freezing temperatures will occur. Materials found around your home that are suitable for coverings, include sheets, towels or even newspaper. These materials will provide protection of a few degrees. For more reliable protection, you can use frost cloth (available at your local nursery), which can protect plants from even lower temperatures when used as directed on the packaging. Be sure to remove the coverings in the daytime to allow the surrounding area to warm up again. For more information of frost damage, how to manage it and how to prevent it, please visit The University of Arizona’s Frost Protection Publication. In the meantime, kick up your feet, drink more eggnog and relax by the fire. We will have some work to do next month….planting bare-root roses! Usually after dinner, we take a stroll out in the back garden and check out what is going on in the vegetable garden – cucumbers, corn and tomatoes this week. The fruit trees are heavily laden with fruit – apple and plum trees will soon be ready pick. What drew my attention this week was the young Sissoo (Dalbergia sissoo) tree that had suffered frost-damage from our severe cold snap last winter. The entire top of the tree had died. For a few months, my brother-in-law and mother had waited to see if the tree was still alive and if any new growth would occur. Well, the entire tree above the ground, was killed by the frost. However, at the soil surface, by the tree trunk, there was new growth. There was vibrant new growth occurring. So, I recommended that they keep the tree and remove the dead part of the tree. This was easily done using a pruning saw. There were numerous new branches growing from the base and we selected the strongest one to keep and pruned off the others. We kept the stakes and simply readjusted downward to help hold up the new growth, which will help to train it upright. Of course, the other option was to remove the entire tree and start over with a new one. However, there is a well-established root system already in place. So why not take advantage of that? When you first plant any type of plant, there is transplant shock and then it takes time for the roots to establish themselves. By simply selecting the new growth, we have a huge head start. Yes, it is short, but with an established root system, it will grow very quickly. A Morning Walk With 2 Special Guests…. I absolutely love this time of year. The weather is gorgeous and everything is in bloom. Although the afternoons can get a little hot, the mornings are still cool and a perfect time for a walk through the neighborhood. Now before we leave on our walk, I almost always bring my camera with me, because you never know what you might see. Today, along with my husband, I brought 2 special guests with me…. Meet my twin nephews, Dean and Danny. They are now over 7 months old and ready for an adventure. So lets get started, shall we? The first thing that I took a photo is of my neighbor’s frost-damaged Queen Palm. With the deep freeze we experienced last winter, most of the Queen Palms in our area were hit hard. Thankfully, my neighbor is not pruning off the frost damaged fronds yet. You see, all palms need the ‘food’ that the fronds produce and the frost damaged fronds are still green at the base. So, if yours look like this one, leave the frost-damaged fronds alone until they fall off naturally. We pass by an Australian Bottle tree (Brachychiton populneus) that is in full flower. We had one of these beautiful trees in my front garden in Southern California, where I grew up. I used to imagine that the flowers were fairy caps and that the fairies would hide during the daytime. Although I live in the desert, there are not too many people who grow cactus in their front gardens in my neighborhood. There is however, one house that has lots of it and my kids call it the “Cactus House”. Their Prickly Pear cactus is in full bloom and bees can hardly get enough of the pollen. Sadly, not all that we saw was beautiful. Ficus trees are extremely popular in my neighborhood and they got hit hard by the frost. Most of them are coming back though. It is a good idea to wait until the end of May before pruning any remaining frost-damaged branches since they may still be alive. At that time, if the branches have no green leaves, then it is probably dead and you can prune them back to live growth. Okay, here is another rather ugly photo, but in just a couple of weeks, this pruned back Gold Lantana will be covered with green. You can prune back most frost-damaged shrubs and perennials very far. This Lantana is not even 6 inches tall. At first glance, it may appear dead, but at the bottom of the picture, you can see tiny green leaves appearing. I guess it the horticulturist in me, but along with the beautiful, I tend to look at the ugly as well. Thankfully, with gardening ‘ugliness’ is usually short-lived. I can’t wait until everything is in full bloom! Come join us for ‘Part Two’ of our spring time walk later this week…. Does Your Tree Look Like This? Here in the Southwest, we were hit with a deep freeze this past winter. Temps in my garden fell to 20 degrees F. Now we aren’t strangers to occasional freezes each winter. But what made this one different was that we had 4 successive days of extreme cold. As I drive down the streets in my neighborhood, I see trees that look much like the Lysiloma tree above. Do you have trees that suffered frost damage too? Ficus trees seem to have been most heavily affected by frost damage. But I also see some Jacaranda trees that look much the same. Why are the upper branches more affected then the lower? Well, the upper branches were the most exposed to the cold and they protected the lower branches from the cold. With the arrival of warm weather, some of the ugly, brown branches are beginning to be covered with green again. The leaves start appearing towards the bottom of the tree canopy and work their way upward. As a result, you see lush, green growth below and brown up above. So the question that many people have is when do you prune back the brown branches? I recommend waiting at least 3- 4 more weeks (mid-May) to see if any leaves begin to appear. If they do not, then it is usually a sign that the upper branches are dead and can be pruned back. You can also bend the smaller branches to see if they break off easily – this is a sign that the branch is dead. If the branch is still flexible, then there is still live wood inside. Because your tree has lost much its leaves to frost, it often produces a huge flush of new growth like the Lysiloma tree, above. Now you may be tempted to remove some of the excess growth because it looks ‘messy’. But, please DON’T. Leaves are what make ‘food’ for your tree and it needs all the leaves it can get right now until it has produced enough new growth to compensate for the leaves lost. I would recommend waiting as long as possible before removing any excess leaves. Rest assured, before you know it, your tree will soon recover and look beautiful once again. So, I am spending the day starting to pack for my upcoming road trip. It is so much easier when all you have to do is pack yourself and not 3 kids as well. I am traveling with my mother. It is very strange to be traveling without my husband and kids, but I know we will have a fabulous time. I’ll tell you next time…. https://www.azplantlady.com/wp-content/uploads/2011/04/Frost-Damaged-Lysoloma_April-2011-034.jpg 640 564 arizonaplantlady@gmail.com http://www.azplantlady.com/wp-content/uploads/2018/10/favicon.png arizonaplantlady@gmail.com2011-04-27 12:29:002016-10-26 14:36:41Does Your Tree Look Like This? Which Would You Prefer? Poodled or Natural? Anyone who has spent any time with me in the garden, soon learns how much I dislike formal pruning of flowering shrubs and desert trees. In the plant industry, we sometimes refer to this type of pruning as ‘poodle pruning’ because of the over abundance of round-shaped trees and shrubs. I spend a lot of time with clients, teaching them how to properly prune their trees and shrubs and most of the time it does not involve the use of a hedge trimmer. Over ten years ago, the community where I was working asked me to do a consultation for the local church. Part of the consultation involved going over the current maintenance practices. This church had a Texas Ebony tree (Ebenopsis ebano) that had not been pruned correctly. In fact, there were signs that the infamous hedge trimmers had been hard at work…..
Now you may not think that this Texas Ebony tree looks all this bad. There may even be some of you who think that most trees should be maintained this way. – Repeated shearing blocks the sunlight from reaching the interior branches, causing their eventual death which leaves large dead areas which are unattractive. – This same type of pruning actually increases the maintenance required, because each time you prune, the tree works hard to replace the leaves lost. Remember, it is the leaves that make the food for the tree. – This extra growth also requires the tree to take more water, which is already a precious resource here in the Southwest. Now if those reasons do not convince you, please look at the photo below of the same tree, which is now being maintained as I had recommended…. Doesn’t this Texas Ebony look beautiful? Now, a yearly pruning using a lopper or pruning saw is all this tree requires instead of multiple visits using a hedge trimmer. Prune any dead and/or crossing branches and any over-reaching side branches as desired. Raise the tree canopy gradually until you reach the desired height above the ground. Texas Ebony is a slow-growing tree with beautiful, dark green leaves. It does have thorns, so be sure to wear gloves and keep away from high traffic areas. Brown seed pods appear later in the year. So, which one would you rather have in your garden? https://www.azplantlady.com/wp-content/uploads/2011/03/P1010002.jpg 640 573 arizonaplantlady@gmail.com http://www.azplantlady.com/wp-content/uploads/2018/10/favicon.png arizonaplantlady@gmail.com2011-03-03 12:27:002016-10-26 14:36:42Which Would You Prefer? Poodled or Natural?